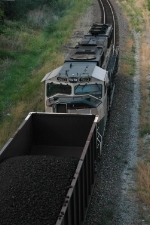 Description: Coal train on its way East out of Lincoln. Description: DPU on loaded coal eastboud. Gotta love how those new hoppers highlight the terrain! Description: My rover started to over heat again, and when I pulled over a loaded coal train came south outta the fog and snow. 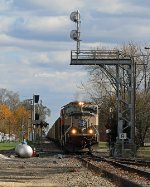 Description: Z-STPCHC rolled into La Crosse while the sun was playing "hard to get"!!! 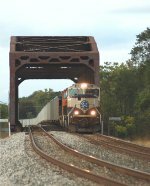 Description: BNSF (ex-BN) SD70MAC 9613 leads an westbound train out of Memphis and across the Harahan Bridge to Arkansas. Description: A northbound empty coal train crosses over an aging Santa Fe bridge on the way out and up to Wyoming. Description: An empty coal train with a pair of ES44ACs and SD70MACs leading the way head north for the Wyoming coal fields.